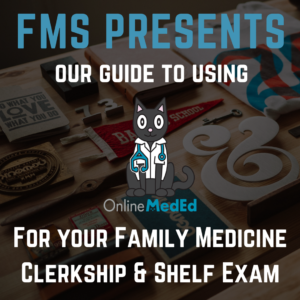 FMS presents: Our downloadable guide to using OnlineMedEd.org to succeed during your Family Med rotation. Family Medicine rotations are highly variable, lasting anywhere from four to eight weeks. OnlineMedEd is an awesome resource, and ideal for building a foundation in the ‘little bit of everything’ that is FM – however, they don’t have an FM topic category, and we wanted to fill that gap. The standard advice is to read on three patients per day, and that holds true in FM as in any topic, but since FM covers everyone and everything, it can help to have a guide to be sure you’re covering all the basics. How Did We Choose the Videos? We’ve curated a list of 54 OnlineMedEd.org videos covering key topics for the Family Medicine NBME shelf / COMAT. As you look at the guide please note that videos in bold are the ones we think are most important to view, while those preceded by a +/- less so. They are roughly based on the topics listed for the relevant shelf/COMAT exams by the NBME and NBOME, as well as our personal experiences. If you watch three videos per day you’ll be done in about 16 days, but we expect you’ll modify your viewing to suit your needs. With that in mind, we’ve also included a list of relevant Internal Medicine videos that are especially useful if you’re on a longer rotation (ie: six to eight weeks), and for the gunners there is a “weekend before rotation” guide, too. We really don’t recommend using the gunner guide unless FM is your first rotation of third year. But if you do start clinical experience with FM, the ‘gunner guide’ is a good way to feel a little more prepared for that first day. Always consult your medical school’s FM syllabus, and/or either the NBME shelf description / COMAT description for superior information on knowing what is relevant for your end of rotation exam. FMS makes no guarantees regarding your shelf scores. However, we gently remind you that you need to read, watch, review, ask questions and learn all you can to do your best on the floor and on your shelf exams! Get our guide to using OnlineMedEd for Family Med Clerkships! UPDATE 2016-07-12: Added grayscale version of the guide, for easier downloading and printing! ← Why Do OnlineMedEd’s Free Clinical Education Videos Work?